Howlin' Wolf Records: SIX STRINGS: Lionsgate: WHILE WE'RE YOUNG! Ben Stiller and Naomi Watts are Josh and Cornelia Srebnick, happily married middle-aged members of New York's creative class. They tried to start a family and were unable to — and have decided they’re okay with that. But as Josh labors over the umpteenth edit of his cerebral new film, it’s plain that he has hit a dry patch and that something is still missing. Enter Jamie (Adam Driver) and Darby (Amanda Seyfried), a free-spirited young couple, who are spontaneous and untethered, ready to drop everything in pursuit of their next passion — retro board games one day, acquiring a pet chicken the next. For Josh, it’s as if a door has opened back to his youth — or a youth he wishes he once had. It’s not long before the restless forty-somethings, Josh and Cornelia, throw aside friends their own age — including Beastie Boy Adam Horovitz in a sly supporting role — to trail after these young hipsters who seem so plugged in, so uninhibited, so Brooklyn cool. “Before we met,” Josh admits to Jamie, “the only two feelings I had left were wistful and disdainful.” But is this new inspiration enough to sustain collaboration and friendship with a couple twenty years their junior? 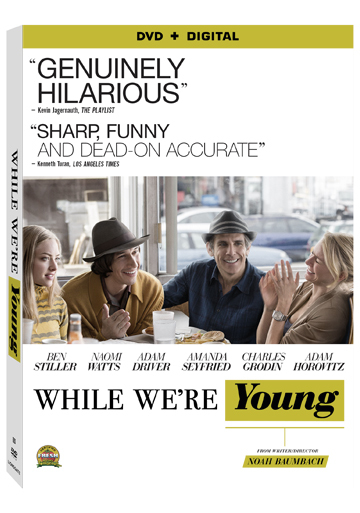 While We’re Young is an openly funny cross-generational comedy of manners about aging, ambition and success, as well as a moving portrait of a marriage tested by the invading forces of youth. No film has better captured the weird, upended logic of urban sophisticates: the older ones embracing their iPads and Netflix, the young ones craving vinyl records and vintage VHS tapes. Powered by Stiller and Driver's note-perfect lead performances and loose, comic turns by Watts and Seyfried, While We’re Young is a complete pleasure to watch.